We've just given our friends at Phonica 15 EXCLUSIVE white label 12" copies of the forthcoming single by Detachments called FEAR NO FEAR and featuring remixes from NAUM GABO and MOSCOW alongside the fearsome original. Go get! Once they're gone they're gone! Not out officially until July 7th. Catch the band live this Friday at Notting Hill Arts Club - free entry before 9pm and I'll be DJing later on too. Message me for cheap guestlist if you want to come along after 9pm. This week sees the release of the latest Thisisnotanexit 12" (and digital download / mp3 if you're that way inclined). By Professor Genius after his inital releases on Italians Do It Better and Disques Sinthomme comes A Jean Giraud (Part One) featuring A Jean Giraud 1, 2 and 3 as well as a version by Brennan Green. Pitchfork picked it up to stream so that says something about the quality! Part Two will be released later this year - and if there's enough demand we might press some cds featuring all of the tracks compiled together. 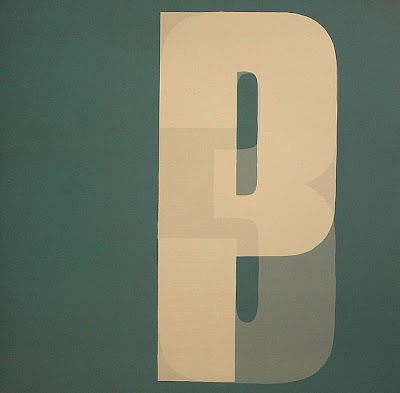 Out on Monday is the new Portishead album after 10 years away. Seriously seriously amazing - and sees Portishead tear up their original sound and embrace various points of industrial and kraut rock. Check Machine Gun for what can only be described as a 105 bpm smacked out version of New Orders Blue Monday pushed through a distortion pedal and topped with Beths smoky vocals. We Carry On is the other highlight with what can only be described as a pounding Silver Apples drum and organ sound and a fast paced techno 127bpm. Then Adrian Utleys guitar kicks in and WOW oh WOW. This sounded absolutely massive at the sub club on Sunday night when I played at Optimo. Both are going to be in my record box all summer. 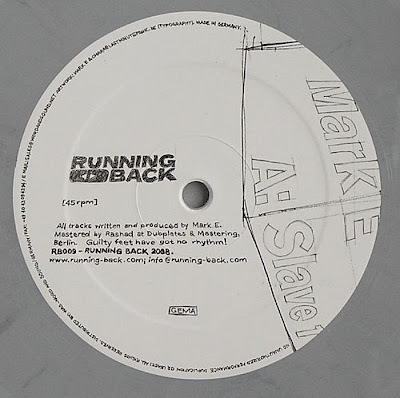 Finally Mark E's new 12" hit the stores on Gerd Jansons great label Prosumer. Check out Slave 1 on the A Side for a beautiful chopped up piece of slo-mo disco action. I loved this since I heard it on Beatsinspace a while ago and am loving it now I've got it on 12" - go buy and support Prosumer!! They're a small label you should support rather than the behemoths of capitalism that the majors are. In regards to Thisisnotanexit events there is alot going on at the moment - They Came From The Stars I Saw Them play the Proud Galleries tomorrow night (Saturday 26th April). After that Detachments & Simon A. Carr play Notting Hill Arts Club on Friday 2nd May (Free entry before 9pm!!). 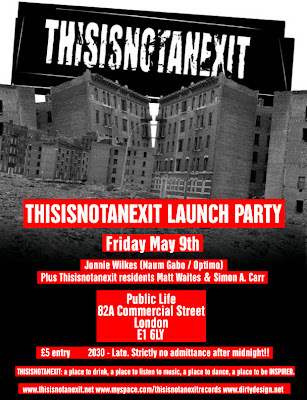 On May 9th we are launching the monthly THISISNOTANEXIT night after searching for a venue for a while. We've got Jonnie Wilkes from Optimo headlining the first one - and then after that some marvellous special guests lined up. 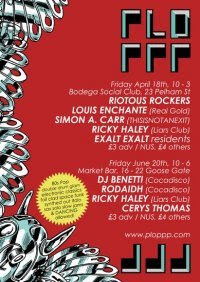 The second Friday of every month at Public Life with residents Simon A. Carr and Matt Waites. On Tuesday May 13th we are having a JOINT launch party to celebrate the launch of They Came From The Stars I Saw Thems new single The HOT Inc. and Album plus The Chaps Mega Breakfast album. 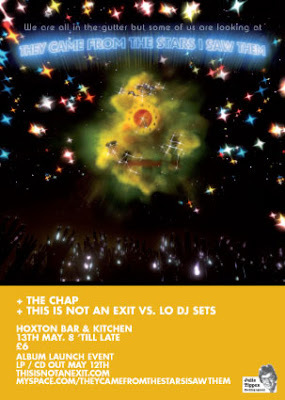 Anyway the event will take place at the Hoxton Bar & Kitchen and will also feature DJ sets from Lo Recordings and Simon A. Carr. £6 entry. Should be a blinder. They have also been picked as a Top 10 NEW BAND on the site SUPERSWEET. Nice. Fear No Fear - the debut release from them will be in stores on July 7th with remixes from Naum Gabo and Moscow alongside the HUGE original mix. I'm then heading back to London in to see The Chromatics on Saturday night. They're debut UK gig which is exciting. Sunday I'm flying up to fill the shoes of JD Twitch & Wilkes at Optimo in Glasgow. Its a huge honour to be asked to look after the club whilst they're away in Japan but it should be a blast. Professor Genius - A Jean Giraud (Part One) (TINAE 005) is OUT NOW digitally and available to buy on nice black plastic on MONDAY 21st April. Go get one. It's a beautiful release. 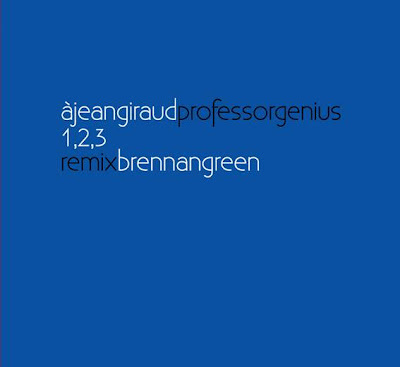 A real nice piece on the new Professor Genius A Jean Giraud 12" ran in The Independent on Friday. Its out Monday 21st April so make sure you go buy a copy! Enjoy - always a good day when Pitchfork is on your side! Had a wicked time in Oslo at the weekend - big shout out to Pál from Mungolian Jetset and the guys from Club Bláá who looked after myself and They Came From The Stars I Saw Them. Club Bláá was a wild night - I ended up Djing the majority of the night so threw down a whole load of new Thisisnotanexit jams mixed up with some disco and house of the highest order. Lots of fun. Lots of dancing and whooping to the Faze Action Remix of Hatchback! "Space is the place" is a FUTURE classic too. Watch out for that on Luna Flicks soon! They Came From The Stars I Saw Them also played a blinding set - The HOT Inc. being a particularly large highlight. And G-Ha who Djed at the end was great fun - hearing the Brennan Green Remix of Professor Genius at 2.30am led to me jumping around and being a bit too excited in the backstage area! Big shout outs to Mental Overdrive, Kango and Todd Terje who all said hi! If you're in London this week Detachments are playing Bar Rhumba on Wednesday April 2nd - go see them - a great lineup and the band are really on fire at the moment!